Last October, Columbia University combined academia’s built-in spirit of competition with a red-hot deadline and managed to raise $6.9 million in a single day—five times more than its previous one-day fund drive. 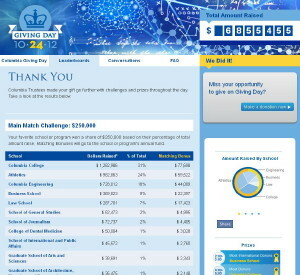 Inspired by the state-wide “Give to the Max Day” in Minnesota, “Giving Day” pitted the alumni of Columbia’s 16 schools and programs, ranging from the School of Social Work to Athletics, against each other to see which ones could raise the most money online in 24 hours. Key to the project was the challenge match: Trustees contributed $400,000, which was divided among three categories: $250,000 for the top five money-raisers; $120,000 for the top five participants; and $5,000 for the top six winners of the hourly events posted on the challenge web site. Each program was reponsible for its own promotion, and most posted the event on their web sites. percent were first-ever online givers to Columbia. She explains how that single, successful day was a year in the planning. Development staff researched similar programs and raised the matching funds from trustees. Techies set up the dedicated Giving Day web site, Facebook pages, banner ads for the various schools to use on their individual web sites and Facebook pages. Donations could be accepted at multiple portals. Alumni from the different schools were asked to serve as leadership givers. The publicity roll out began October 1, with announcements on Facebook, Twitter, the Columbia magazine and web site, and on each of the different schools’ web sites and Facebook pages. Some schools sent postcards; most emailed their alums. The university’s call center was used to alert alumni to the Big Event. Giving Day began at midnight, so donations started out slowly, but had picked up steam by 9 a.m. To keep the momentum going, live events were streamed on the Giving Day web site, starting with a Deans’ roundtable, followed by an interactive webinar with neuroscientist and Nobel Laureate Eric Kandel. Real-time fundraising tallies were posted on both the Giving Day site and the Facebook page; as alumni made donations, they encouraged their friends to do so through Facebook postings. To keep things moving in the afternoon, six prizes of $5,000 each were offered for hourly challenges, such as “Most International Donors” from 2 p.m. to 3 p.m. (won by the Business School) or “Random Donor” from 6 p.m. to 7 p.m. (won by Engineering and, at a later challenge, Journalism). Since “Giving Day” was devised to “elevate people who give smaller gifts into the limelight,” Wong says, she was surprised at how the effort also energized some major Columbia donors. The School of Engineering actually got a $2.5 million gift, and a major donor to the College, reacting to the pride of winning the challenge, matched its $1.2 million the following day. (To keep a level playing field and give the smaller schools a chance to win, the challenge only counted $250,000 of any gift.) As for the goal to attract new donors, Giving Day collected some who weren’t in their databases but were friends of alumni. Columbia is now planning next year’s university-wide Giving Day, also next October. Heidi Waleson is the opera critic for The Wall Street Journal and writes about the performing arts for a variety of national and international publications.